Super Typhoon Haima has weakened and blown out to sea after smashing into the northern Philippines with ferocious wind and rain. Flooding, landslides and power outages were evident but large casualties appeared to have been averted after nearly 100,000 people fled to safer ground. Haima's blinding winds and rain had rekindled fears of the catastrophe wrought by Typhoon Haiyan in 2013, but there were no immediate reports of any major damage. Several villages are cut off by fallen trees, landslides and floods, impeding communications and aid. Although storms are a part of life in the country's north, many villagers were still horrified by Haima's fury. "In my age, I'm 60 years old, this is the strongest typhoon I have ever seen," village councillor Willie Cabalteja said in Vigan city in Ilocos Sur province. "We haven't slept. Trees were forced down, houses lost their roofs and fences and metal sheets were flying around all night." At least seven people were killed in the storm, officials said. But the evacuations from high-risk communities helped prevent a larger number of casualties. Two construction workers died when a landslide buried their shanty in La Trinidad town in the mountain province of Benguet, officials said, while two villagers died in another landslide and another was swept away in a river and remains missing in Ifugao province, near Benguet. A 70-year-old man died apparently of a heart attack in an emergency shelter while another man died after being pinned by a fallen tree in Isabela province. One other typhoon-related death was reported in northern Ilocos region but details were not immediately available. Haima, with sustained winds of 225 kilometres (140 miles) per hour, hit north-eastern Cagayan province late on Wednesday then barrelled north-westward before blowing out into the South China Sea with sustained winds of 150kph (93mph) and gusts of up to 185kph (115mph), according to forecasters. 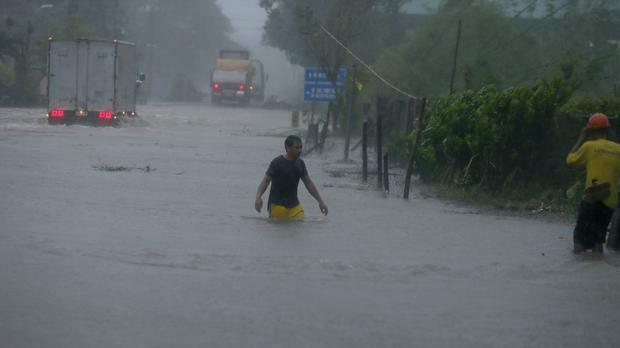 Although weakening, the typhoon was expected to blow towards China, Filipino forecasters said. After dawn, the extent of damage in Cagayan - about 500 kilometres (310 miles) north of Manila - and nearby regions became evident, with overturned vans, toppled or leaning electric posts and debris blocking roads. Most shops, their window panes shattered and canopies shredded by the wind, were closed. In northern Ilocos Sur province, rice fields resembled brown lakes under waist-high floodwaters, although clean-up operations had started. "Search, rescue and retrieval operations are ongoing," Office of Civil Defence administrator Ricardo Jalad said in a statement. The region is still recovering from a typhoon last weekend that killed two people and displaced tens of thousands of villagers. President Rodrigo Duterte, on a state visit to China, urged people to heed orders by disaster agencies. Mr Duterte is to fly home on Friday. About 20 typhoons and storms lash the Philippines each year, adding to the burdens in a country also at risk of earthquakes and volcanic eruptions. In November 2013, Typhoon Haiyan struck the central Philippines with ferocious power, leaving more than 7,300 people dead and displacing more than five million others after levelling entire villages.